Saturday's penultimate day of racing at ISAF Sailing World Cup Qingdao delivered not just the top 10 teams advancing to Sunday's medal race but also place on the starting line at the Rio 2016 Olympic Sailing Competition for Singapore in the 470 Women and China in the 470 Men. 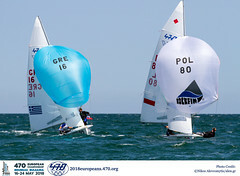 The only Asian leg of the ISAF Sailing World Cup series, was also the Asian continental qualification for 4 Olympic classes – 470 Men and Women, Nacra 17 and Finn. 5-9 knot northern breeze and once again, strong current, tested the sailors as they put in last ditch efforts to make the Medal Races and push for Olympic qualification. Over the last few days' Austria's David Bargehr and Lukas Mähr have quietly gone about their business in the 470 Men fleet with their eyes fully focused on stringing together a solid series of races. After a shaky start that featured a 4-12-(17), they moved on nicely as a 3-2-4 followed. But it was Saturday's races that saw them excel even further as they posted a race victory and a second which propels them up into top spot. "Today was really tough, really challenging and light winds. We've never sailed in Qingdao before; it's actually our first time so every day is a little bit new for us. "We have had to find out how the wind works and this current, it's amazing," Bargehr said with a puff of air that was almost like a sense of relief but in the same breath, with a smile to signify the importance of the task that Qingdao offers. "We have come from a lake so we are not used to sailing in current and it's pretty tough and pretty challenging but it's a good challenge. At the beginning we made some mistakes because we didn't know how to sail here. We feel more comfortable now and I think you'll see this in the results." What can be seen in the results is an Austrian boat leading the way on 28 points, three clear of Hao Lan and Chao Wang (CHN) and four ahead of overnight leaders Onan Barreiros and Juan Curbelo Cabreara (ESP). 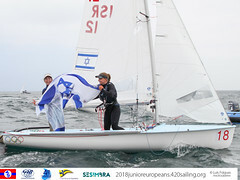 Bargehr and Mähr were brimming with smiles after racing, not because of their performance, but because of the significance of the Men's 470 competition and being in China's sailing city. "This event is the qualification for the Asian ticket for the Olympic Games and you can really feel this intensity because everybody is really trying to get to the Olympics," explained Bargehr. "You feel it at the start and at the marks, it's everywhere and you can just feel it. "It makes it a lot of fun and it's just great. "We've never been so for us it was really important for us to come to Asia, to Qingdao. The older guys from Austria they were like 'yea QINGDAO, you must do this, eat this, do that'. We didn't know what to expect but now we know what it is like and to get the ranking points from the world cup is important." The Austrians have all but guaranteed themselves a medal but the points different between the top three is exceedingly close and will make for an intriguing Medal Race. China have guaranteed themselves a spot on the Rio 2016 Men's 470 startline as Lan and Wang hold an unassailable advantage over the chasing Asian teams. In the Women's 470, China's Xiaoli Wang and Lizhu Huang made their assault on the podium by snapping up a pair of race wins to move into second overall. As a result they are two points off of Ai Kondo Yoshida and Miho Yoshioka (JPN) who held onto their lead following a 3-2. Shasha Chen and Haiyan Gao (CHN) occupy the final podium position, nine points off of the Japanese pair. Singapore's Priscilla Low and Shu Xian Lee qualified their nation to the Rio 2016 Olympic Games by the narrowest of margins. They ended the regatta level on 76 points with Nuraisyah Jamil and Norashikin Mohd Sayed (MAS) but sit above them having finished eighth three times compared to the Malaysians single eighth. The Malaysians put in a protest at the end of the day but it was dismissed by the jury, allowing the Singaporeans to celebrate. "We're very very happy at the moment, we're so relieved. We've qualified the country," the pair said almost in harmony with big smiles. "We came here with one plan and one plan only and that was to qualify and we did it so we're really happy," explained Low. "Our final race was not very good so we were very worried when we came back and saw the results. Then we had a protest which was expected but we didn't think it would be a big deal because that would have been our discard." 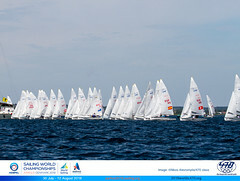 High resolution imagery free for editorial usage will be available throughout ISAF Sailing World Cup Qingdao via - https://www.flickr.com/photos/isafmedialibrary/albums/72157658138633909.